More bad news from EA: Along with the 1500 job cuts announced yesterday, CEO John Riccitiello has said that the company has taken the axe to "over a dozen" unannounced projects in development. Yesterday during EA's quarterly earnings call with investors, the publishing giant announced that it was making cuts at several of its studios that would amount to approximately 1500 workers laid off by the end of next March. This is the most severe round of layoffs the publisher has seen yet, with 600 workers laid off last October and 1100 jobs cut in February - including 200 at Need For Speed developer EA Black Box, which was also one of the affected studios this time around. CEO John Riccitiello said that in addition to the job cuts, the publisher had pulled the plug on twelve or so titles in development that had yet to be announced, judging the games to no longer be worth the price - or the risk. "Electronic Arts has a core slate of games labels and sports franchises that we will iterate on an annual or bi-annual basis," explained Riccitiello, "All of them are selling or have sold in their most recent edition 2 million units or more ... after that, we've got The Sims and Hasbro, and frankly anything that doesn't measure up to looking like it can pencil out to be a very high profit contributor and high unit seller got cut from our title slate from this point going forward." This is bad news for people who may have been hoping for a sequel to last year's Mirror's Edge, as Riccitiello has previously said that he was disappointed with the first-person parkour game's performance. Dead Space and its Wii cousin Dead Space Extraction, on the other hand, may have performed sufficiently well to warrant a sequel (though cuts made at developer Visceral may suggest otherwise). My personal feelings on the matter are nicely summed up by the picture you see here above and to the right, taken from this particular Penny-Arcade. 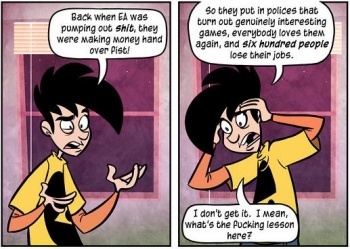 For years, EA was seen as the industry's "Big Bad", a soulless corporation that existed only to churn out sports sequels, to acquire young, thriving studios and put them to work on crappy movie tie-ins, and to cut corners and rush development, all for the sake of a few extra bucks. EA might have been the gaming Antichrist, but in the past two or so years, the publisher made a concerted effort to turn its act around. Riccitiello stated that he didn't see any inherent conflict between creativity and profitability, went on public record as being against DRM, and stated that he viewed the pirated Sims 3 as a demo of sorts to entice people to buy the full game. It was almost a complete turnaround in public perception for the once-reviled giant (it didn't hurt that Activision seemed more than willing to step up into its place as the industry's own "Devil at the Crossroads"), and while certainly not perfect, the New EA was a move in the right direction. Unfortunately, moving in the right direction apparently means that the company has axed 3200 jobs since last October, and if Riccitiello's comments here are any indication, we may see the New EA turning back into the Old EA - a company that emphasizes profitability as the bottom line, with a focus on safe titles that the higher-ups know will sell. And that would honestly be one goddamn shame.